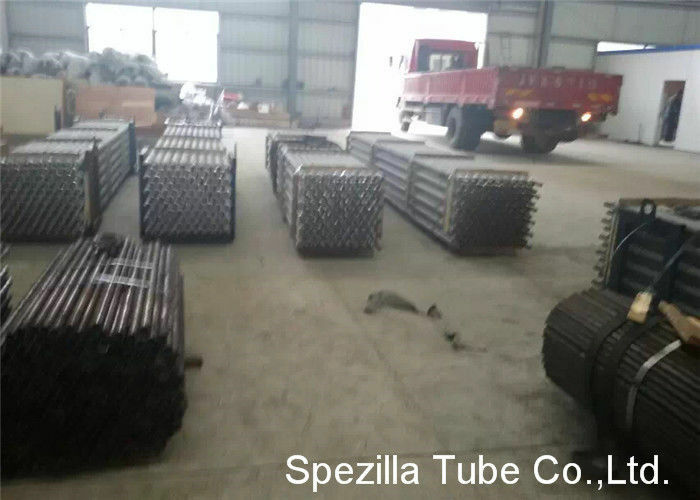 SPEZILLA supplies the highest quality welded finned tubing to any part of the world for use in oil refineries, petrochemical plants, power generating stations, fertilizer and gas production plants. The newly designed manufacturing facility, with our high frequency resistance welding machines, enables us to perform large scale projects in reduced times. The steel fin (solid or serrated) is helically wound and continuously welded to the tube by high frequency electric resistance welding. This produces a homogeneous, clean and continuous fin-to tube bond with no additional weld material, for a very efficient heat flow and resistance to corrosion. The main uses for high frequency welded finned tubes are in the heat recovery associated with boilers for power generation and in furnace applications for the various processing industry. Our high frequency welding finning machines are capable of handling tube diameters from 21 mm o/d to 273 mm o/d and tube lengths of up to 26 meters. Fin sizes range from 6 mm to 38 mm high and from 0.8 mm to 3 mm thick. Welded Helical Solid Finned Tubes are manufactured with by helically wrapping fin strip on edge around the tube circumference and continuously welding the fin strip to the tube. The fin strip is held under tension and confined laterally as it is formed around the tube, thereby ensuring that the strip is in forceful contact with the tube surface. A continuous weld is applied at the point where the fin strip first begins to bend around the tube diameter using Vulcan’s unique gas metal arc welding (GMAW) process. This weld process creates the strongest fin to tube attachment in the industry, excellent heat transfer characteristics, low fin-side pressure drop and little to no change in grain microstructure and physical characteristics even when 3%-9% chromium tubes are used. 1. The parameters and performance are as follows: 1: Technical parameters: The high degree of fin 0-16mm (or outside diameter of fin φ 25mm-φ 82.5mm); Pitch of fins 2.0-5.0mm; Length of finning tube 0.5~ 14m. 3. 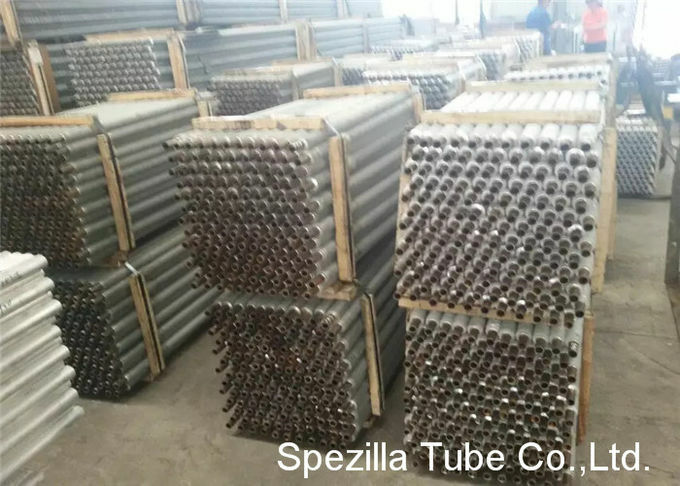 Double metal rolling finning tube: Tube-based protection from the outer layer of aluminum tubes, corrosion-resistant; Tube-based can be made from carbon steel pipe, in addition to, stainless steel tube and copper tube can also be used, as well as titanium alloy tube. Package: The aluminum finned tubes are well packed in plastic film in the inner and steel frame in the outer! Tube O.D: 3/4" to 10"
Tube material: Carbon steel / Alloy steel / Stainless steel / nickel / high nickel alloy / nickel copper / nickel - chrome - iron / copper alloy /etc. FIN Material: Carbon steel / stainless steel / high nickel alloy / etc.